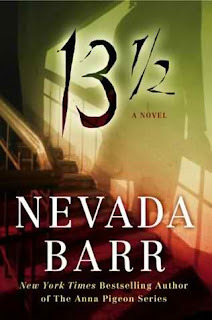 Nevada Barr is the best-selling author of the Anna Pigeon mystery series; 13 1/2 is her second stand-alone novel. In 1971, a young boy murdered his family in "Amityville-Horror"-style and has been known forever after as "Butcher Boy". Throughout his years of imprisonment, "Butcher Boy" experienced horrible drug-induced treatments from doctors in an effort to get the young boy to remember the gristly details of the night he has forgotten. Meanwhile in present-day New Orleans, a woman with her own troubled childhood named Polly is years into her new life with children of her own. When Polly meets and falls in love with an architect named Marshall, strange and scary things begin to happen that just may threaten Polly and her children's lives. Will Polly learn the truth before it's too late? 13 1/2 is well-crafted and put together; it'll definitely keep readers guessing until the end. Seasoned mystery readers will have an inkling of the outcome, but the story is still super suspenseful regardless. In addition to Polly and Marshall, the supporting cast of characters is very eccentric, adding to the overall dark flavor of 13 1/2 . The novel is also sprinkled with cryptic journal entries about true crime killing sprees, causing you to second-guess the potential outcome. Nevada Barr's Anna Pigeon series begins with Track of the Cat (1993) and follows with A Superior Death (1994). Her newest release is book sixteen of the series entitled Burn (2010). I'm reading 13 1/2 right now, and it's the first Nevada Barr book I've read. I picked it up because the synopsis looked eerily familiar. I lived in Rochester Minnesota when 16 year old David Brom murdered his mother, father, younger sister and brother with an axe. His older brother survived only because he was away at college. I think that happened in 1988. Wondering if that was the inspiration for at least the first part of the book. In an interview I read with Barr online, she mentions that her inspiration stemmed from a murder in Minneapolis that had occurred years ago and it just stuck in her mind. It just might be the same murder you're referring to!